More countries currently see the United States as the world’s leading economic power than China. This is particularly true in Latin America and the Asia-Pacific region. Few name Japan or the European Union as the world’s leading economic power today. But, while perceptions of current economic leadership are somewhat divided between the U.S. and China, when it comes to preferred global leadership, there is no competition. Majorities or pluralities in nearly every country surveyed say the future would be better if the U.S. were the world’s leading power than if China were. 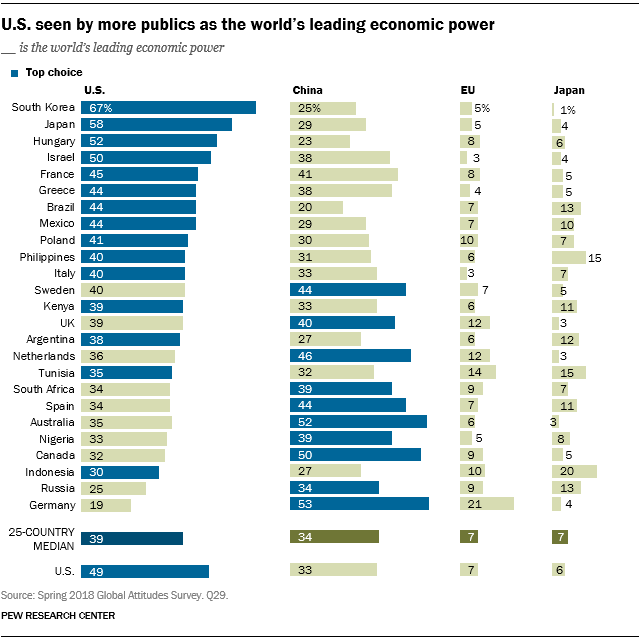 The publics surveyed tend to believe the U.S. is the world’s leading economic power, albeit by a somewhat slender margin. Across 25 countries, a median of 39% name the U.S. as the top global economy, while 34% say it is China. Fewer say this about the EU or Japan. America is seen as the leading economy in all three Latin American countries surveyed – Brazil, Mexico and Argentina. In the Asia-Pacific region, only Australians are more likely (52% vs. 35%) to name China as the world’s leading economic power. Australians have, in fact, consistently named China over the U.S. since the question was first posed in 2008. In sub-Saharan Africa, publics in Kenya, Nigeria and South Africa are divided in their views: No more than four-in-ten name either the U.S. or China as the world’s top economy. European opinion, too, is mixed. In the two Eastern European countries surveyed – Hungary and Poland – the U.S. is the clear favorite. In the Southern European countries of Italy and Greece, too, more name the U.S. than China. But in France and the UK there is no clear consensus; nearly as many point to the American as to the Chinese economy. Meanwhile, in the Netherlands and Germany, opinion leans in favor of China. This is especially true in Germany, where about half (53%) view China as the world’s economic leader. Germans name the EU as often as the U.S. as the world’s leading economic power (21% vs. 19%). Compared with a year ago, slightly more in the UK, France and Poland name the U.S. as the world’s leading economic power. By contrast, Germans are now less likely to see the U.S. as the globe’s dominant economy. Regardless of which country people think is the current leading economic power, one thing is consistent: Most publics surveyed prefer the American leadership. When thinking about the future, a 25-country median of 63% say they prefer a world in which the U.S. is the leading power, while just 19% would favor one in which China leads. In the Asia-Pacific region, few say they prefer China. Among China’s immediate neighbors, preference for the U.S. is particularly high: 81% of Japanese, 77% of Filipinos and 73% of South Koreans all favor a future where Washington, not Beijing, leads. In Australia – where 52% say China is the current leading economic power – nearly three-quarters still say they prefer a future where the U.S. is the world’s dominant power. Argentina, Russia and Tunisia stand out as the only three countries where just one-third or fewer prefer U.S. leadership. In many countries, preference for a U.S.-led world order is linked to ideology. Those on the ideological right are more likely than those on the ideological left to say that it’s better for the world if the U.S. is the dominant power. This ideological divide is most pronounced in Israel, where 74% of Israelis who self-identify as being on the right say they prefer Washington’s leadership, compared with 45% of those on the left.